A 20 something-year-old young woman, living with her sister, is in the pursuit of becoming a lawyer and overcoming all of life’s challenges. Which sadly includes racism and, sometimes, an unsupportive family. With ABC really trying to show diversity means more than having different colored faces, and a random homosexual here or there comes Cristela. A show which deals with various aspects of both Mexican and Texas culture. Whether it is Cristela’s mom being from a small village and immigrating to America; gender norms; racism in the modern day; or various other topics; Cristela is much more than another young woman in pursuit of a dream. No, she is a Brown girl who is proud of her heritage and is looking to not have said heritage be something which holds her back but be part of what makes her flourish. When we meet Cristela (Cristela Alonzo) it seems she and sister Daniela (Maria Canals Barrera) are living under their mother Natalia’s (Terri Hoyos) roof. Truth is however, they are living in Daniela’s husband’s house and because Natalia is unable to live by herself, and because Cristela doesn’t have a job, they both live with him and his family. Which, as you can imagine, causes issues. But with Natalia not sticking her nose in Felix’s (Carlos Ponce) business, but Cristela often butting heads with her brother-in-law, pretty much Cristela is the sole one who has any issue with the living arrangement. To the point that often Daniela has to defend her because of the things she says and does. But, despite Cristela’s antics, at the end of the day, they all are family and, while it has been 6 years in the making, they all support Cristela’s dreams to become a lawyer, in their own unique ways. I don’t want to say this show is refreshing, but at the same time, it is hard to deny how interesting this show is because Cristela, and her family, don’t treat being Mexican as something to be swept under the rug nor treat it as the elephant in the room. Ceistela’s culture, and heritage, is on full display by Spanish be spoken throughout the episode; her mother Natalia speaking about the life she had before immigrating; and with the general sense that we are going to get a less heavy-handed approach than Black-Ish when it comes to Cristela’s culture, it is hard to not want to learn as much as Cristela, and her family, is willing to give. Especially when it comes to the issues presented in the pilot. Take for example her niece Isabella wanting to do soccer over cheerleading and this causing issues due to gender norms, or the situation at Cristela’s job where racism is so casually thrown around it is flabbergasting. Which I honestly liked seeing for how often are these problems, both inside the home and outside, are addressed? I mean, Switched at Birth touches on similar topics to a point, but it barely has gone into Regina’s culture, so seeing Cristela make a full dive is exciting. One thing which maybe an issue for the show is its use of racism, stereotypes, and prejudice for jokes. For while some of the things said are funny, I must admit I am worried about a joke one day going too far. Especially since the jokes are not just between Cristela and members of her family, but also by Trent (Sam McMurray) and Maddie Culpepper (Justine Lupe) who are two white Texans. And just to give you an idea of the jokes done: there is not only the maid joke we saw in the trailer, but Trent talks about calling immigration on Cristela if she doesn’t do a good job, instead of simply firing her. Which I believe was a joke, but I can imagine those who are a bit more sensitive to jokes dealing with race/ ethnic backgrounds being a bit uncomfortable. Other than that, I wished they included subtitles for when the casts speaks Spanish. For while it isn’t done for a long period of time on the show, perhaps just a sentence or two, still, I would like to know what is being said. What I like about this series, in comparison to Black-Ish, is that it is less in your face about the culture presented. Simply put, Cristela and her family are Mexican and they are presenting just some ways Mexican people act and what they deal with. 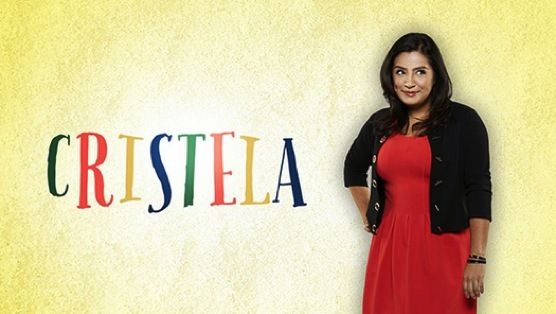 Whether it is the mom’s constant guilt over how easy she made life for her kids, the issues of gender norms within the Brown community , or what Cristela deals with at work, yes maybe the personalities are exaggerated to a point, but something about this show still feels very authentic. Hence the Watch It label for it is funny, has many touching moments throughout the pilot, and Cristela really does present herself as not just the girl you generally want to root for, but someone who I think presents another case for why representation matters. For really, what other actress do you see that looks, acts, and has the same background as her? I cannot find a straight answer on whether people of Mexican descent should be considered Latino or Hispanic, so I picked the cop-out and am using “Brown community” which is supposed to represent those who are Mexican, Spanish-speaking Caribbean, Central American, and South American.